… and no! I am NOT talking about Rob! It’s time for the yeast to do some of the hard work. While we’re all busy satisfying our sweet tooth over this Easter long weekend, the yeast cells are doing the same! Primary fermentation is the conversion of the sugar in the grape juice to alcohol and carbon dioxide by specifically selected yeast. The strain of yeast selected by the winemaker based on both on its ability to conduct the fermentation efficiently and also on the sensory features they add to the wine. 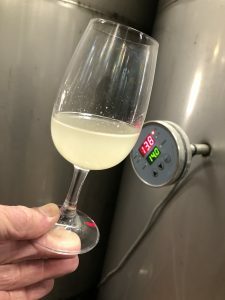 For example, some yeasts produce compounds which add to the fruity and estery characters of the wine, while others are more neutral, allowing greater expression of varietal characters. At the peak of fermentation there will be around 100 million yeast cells in one ml of the fermenting liquid! Temperature is also an important aspect of the fermentation process. The optimum temperature depends on wine variety, style, speed of fermentation, type of yeast, etc. etc. Let’s look at this in more detail in a future blog post. The strain Rob chooses is nice and clean, reliably ferments all the sugar and almost always creates those attractive estery aromas. Our Sauvignon Blanc is about 70% through fermentation and is fabulously aromatic. The Fumé Blanc portion has been split off with some nice “fluffy” (a technical term!) lees and put to barrel. The lees addition will set it apart from the other Sauvignon Blanc by giving it extra weight and body. How does Rob know that a fermentation is “70% of the way through”? You may remember when we talked about Baumé in this post, I mentioned there were two applications for this measurement. Given that Baumé is the measure of the amount of sugar in the juice, then we can use it here to determine how much of that sugar still remains. 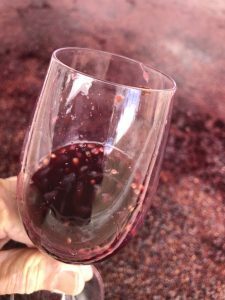 The idea is that when fermentation in “complete” then there is 0 sugar (or close to) left in the resulting liquid (or wine). It is still very early days for the Chardonnay. You may remember that the Chardonnay started out cloudy like this – and yet last week if appeared crystal clear and golden! The grape solids had settled to the bottom, rendering it lovely and bright. Now it’s cloudy again – not because of grape solids this time, but because it is now chock full of yeast cells. Fermentation has been progressing slowly, but it has lovely clean full aromas. Rob is very happy with it so far (as is Heather!). Pinot Noir Rosé is about halfway through fermentation and is ticking along nicely. The colour is lovely and pale (just the way Rob likes it). Although at this early stage, the aromas are quite subdued, they will start to lift closer to the end of fermentation. 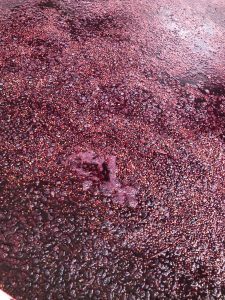 Pinot Noir for our dry red was “pressed” on Monday and the free-run wine and pressings have been blended together. It was then transferred into barrel where the last bit of sugar is now fermenting away quietly. Rob thinks it looks terrific! Free-run is the liquid part of the ferment. The remaining skins and berries are then pressed to release any additional juice. Sometimes these two components are kept separate (depending on the type of wine you’re aiming to produce) as the pressing liquid has more tannin and astringency. Rob always puts the pressings back with the free run, as he likes the weight and “mouthfeel” it provides and the tannins help protect the wine’s colour. 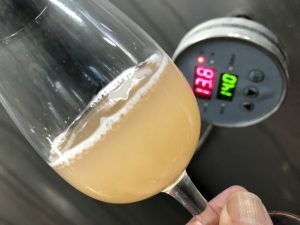 Sometimes winemakers keep the free run and the pressings separate, especially if they’re trying to make a simple wine that’s going to be released for early consumption. Want to see it in real life? Meet Somerled’s Newest Wines: Rob Moody and the entertaining Hugh Armstrong pair up again, bringing you so much knowledge and behind the scenes secrets when it comes to winemaking. 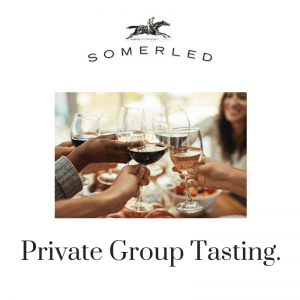 They’ll pour these in-process Somerled wines to hold up against our current vintages and – as always – will pour a special wine for you at the end with commentary from Rob! 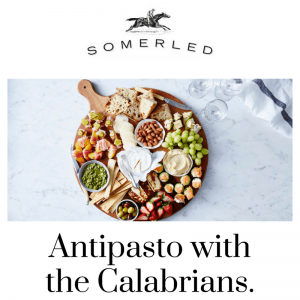 All presented with a sumptuous platter luncheon including Manchego, terrine, pate, crusty French loaves, locally churned butter and all manner of sides. $65pp includes luncheon, book here. April 8, 11:30-1pm, seated event. 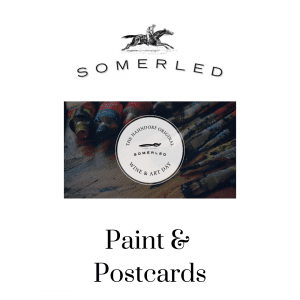 Next Post … but wait, there’s more!